The popularity of the low carb/paleo/Primal way of eating has exploded, as people discover an appealing and sustainable alternative to the restrictive diets and flawed conventional wisdom that lead to burnout and failed weight loss efforts. Until now, high-quality cookbooks written for this growing community simply haven’t existed. The dream of eating satisfying meals—even on a budget—controlling weight and feeling great has now become a reality. Make your transition to Primal eating easy and fun with this innovative cookbook from Primal Blueprint author Mark Sisson, and acclaimed chef/food writer/photographer Jennifer Meier. Included are over 100 mouth-watering recipes with easy-to-follow instructions and nearly 400 brilliant, glossy, full-color photographs to guide and inspire you to cooking and eating Primally. Convenience: Save time with intuitive recipe steps, easy navigation, and great visual support. Find recipes quickly in the following categories: Meat, Offal, Fowl, Seafood, Vegetables, Eggs, Primal Substitutes, Marinades, Sauces and Dressings, Desserts, Beverages. Effortless Weight Loss: As detailed in the Primal Blueprint, losing excess body fat is all about insulin. Regulate insulin production by eliminating grains and sugars and you will lose weight, even if you don’t exercise much or are cursed with the “fat gene”. Easier said than done, right? 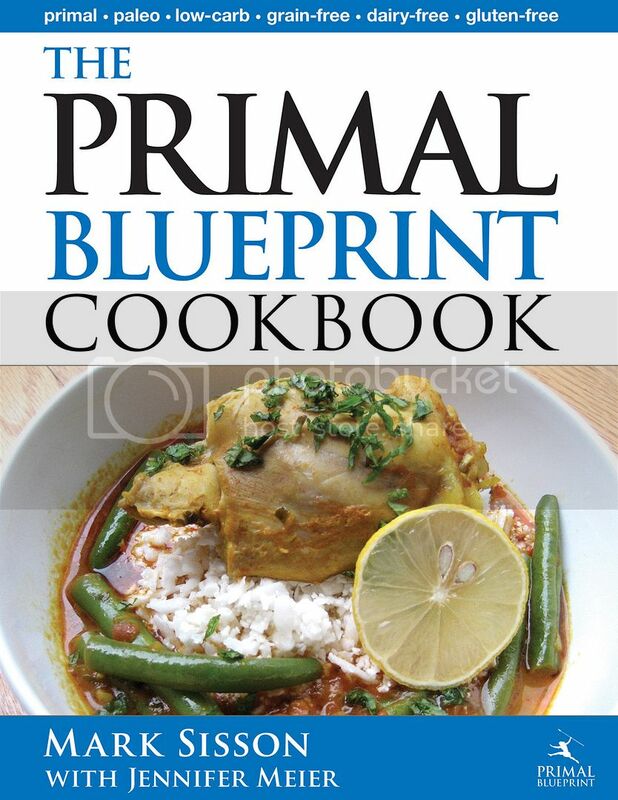 Well, the Primal Blueprint cookbook shows you how to transition from great American grain-based diet to a Primal Blueprint diet featuring meat, seafood, fowl, vegetables, fruits, nuts, and seeds. All of these Primal recipes have a naturally low glycemic impact, keeping your insulin levels—and thus your waistline—in check. No Pasta, No Bread, No Rice, No Beans, No Kidding! : As you build momentum for Primal eating, you’ll find that you won’t even miss the bland, boring, low-fat foods that previously were the central focus of your diet. How can you argue with a menu that includes Roasted Leg of Lamb with Herbs and Garlic, Salmon Chowder with Coconut Milk, Tomatoes Stuffed with Ground Bison and Eggs, and Baked Chocolate Custard? This isn’t a crash course diet. These and the other Primal recipes provide the foundation for a lifetime of healthy eating, high energy and protection from common health problems that arise from eating SAD (Standard American Diet).